HomeTowne at Garland, an active senior living community, especially designed for seniors age 55 and better, optimizes comfort and offers an array of residential, recreational and social choices specifically dedicated to the active senior at affordable prices, which includes a detailed list of community interior and exterior appointments. 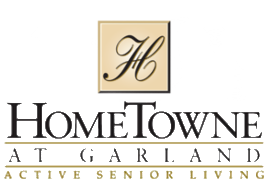 The value of living at HomeTowne Garland begins with maintenance free living and beautiful apartment homes, with careful attention to both comfort and design for active seniors. The 10,000 square foot clubhouse is the centerpiece of our community that offers convenience and companionship. You can experience the peace of mind of a gated community while enjoying a calendar of events and activities beyond compare. HomeTowne at Garland takes care of the necessities so you can enjoy life's simple pleasures.